Weighty Matters: Canadian Nutrition Society Calls 13 Daily Teaspoons of Added Sugar "Moderate"
Canadian Nutrition Society Calls 13 Daily Teaspoons of Added Sugar "Moderate"
To be fair, it wasn't the Canadian Nutrition Society (CNS) directly who told attendees of their recent annual scientific conference that consuming 13 daily teaspoons of added sugar represented a "moderate" amount, it was the handout they stuffed into all their conference swag bags that did. "In 2004 Canadian consumption of added sugars was about 11% of daily energy intake (53g or 13 tsp per day), according to an analysis of dietary intake data from the Canadian Community Health Survey. Average intake ranged from 9.9% of energy in adults aged 19 and above to 14.1% of energy in adolescents aged 9-18 years. 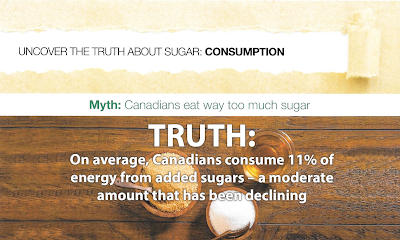 This is generally considered to be a moderate amount"
Given it was authored by The Canadian Sugar Institute, it's wholly understandable that they're not lining up with the World Health Organization or Canada's Heart and Stroke Foundation in considering 12 teaspoons of added sugars per day a daily maximum, and 6 teaspoons of sugar per day a better goal. Less understandable though for the CNS. "foster the next generation of skilled nutritionists, thereby building a better and healthier future for all Canadians"
I struggle to see how providing the food industry with the ability to influence and directly access the next generation of nutritionists would fit within that mandate.